Known then as “Woodbine Cottage”, it was here that the great romantic poet, Percy Bysshe Shelley, spent his honeymoon with Harriet Westbrook during the summer of 1812 - although quite what the bride made of her new husband’s entourage which accompanied them is unclear! 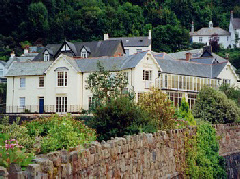 The twenty-year-old Shelley wrote of Lynmouth: "...the beauty of it made us residents here for the summer months.. It combines all the beauties of our late residence with the addition of a fine bold sea. We have taken the only Cottage there was, which is most beautifully situated, commanding a fine view of the sea with mountains at the side and behind us." Later, on July 5th, he penned a letter to his friend William Godwin which described his lodgings: “We now reside in a small Cottage, but the poverty & humbleness of the apartments is compensated by their number..."
Today, Shelley’s offers 11 guest rooms in total, and is extremely highly rated by former guests. The hotel is ideally located for those wishing to explore Exmoor National Park, while towns such as Ilfracombe and Barnstaple are also within easy reach.